It’s not enough to provide port services. 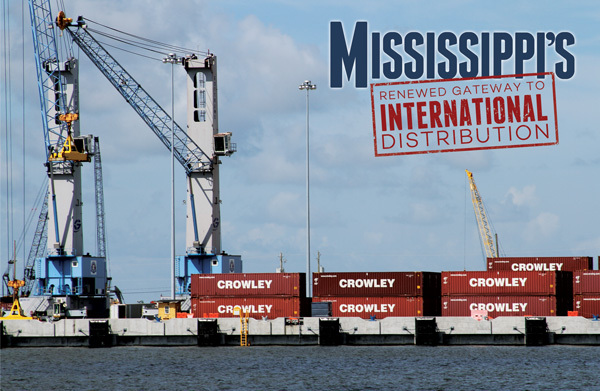 The port business is competitive and the Port of Gulfport is bringing innovative practices along with significant capital improvements to prepare Mississippi’s port for the next generation of shipping, distribution, and nautical business. From catastrophe to something special. When your cloud does not come with a silver lining, you make one. Staying true to Mississippi’s reputation of seeing a problem and attacking it head on is just what Governor Barbour did after Hurricane Katrina struck in 2005. Hurricane Katrina devastated the coast, including the Port of Gulfport. Mississippi had the chance to rebuild the port back to its pre-hurricane state, but it was decided to take the damaged port to a whole new level. Governor Barbour worked with the port and other entities to plan what was to become the silver lining of the disaster of Katrina — a plan that would not only correct the damage, but would take the port to a new level and bring new jobs and economic development to the area in a ripple effect. In the wake of the hurricane, Governor Barbour asked “What can the port be?” and the port authorities put together a plan for “The Port of the Future.” The change in governorship has not lessened the mission or the support. Governor Phil Bryant continues where Governor Barbour left off. The City of Gulfport was established in 1887, specifically in order to open the port. One hundred twenty-eight years later, the city and the port are still growing, with plans for a significant step forward. Still under construction, with some portions of the project not scheduled for completion until 2017, the new Port of Gulfport is already benefiting from completed portions of the planned $570 million development. Plans include shallow and deep channels for shipping, an expanded port, silos, and new warehouses, among other improvements. These upgrades are all part of completing a port to stand strong before its competitors and provide world-class service — leveraging the competitive advantages of Mississippi’s port and its people. Repairing the damage from Hurricane Katrina is a significant part of the reconstruction efforts, but construction goes far beyond the port of the past. Upgrades include structural and infrastructural improvements to accommodate three state-of-the-art electric-powered rail-mounted ship-to-shore gantry cranes. Chemours (formerly DuPont) utilizes the Port of Gulfport to bring in 10 percent of the world’s ilmenite ore for use in creating titanium dioxide at the Chemours facility in DeLisle, Mississippi. Chemours is currently utilizing four silos, and has recently constructed 15 new silos for expansion. The upgraded port will have expanded ground (sound) and wharf space for additional docking and operationing capabilities. Constructed in China by ZPMC, and transported forty-five days overseas, three new, world-class gantry cranes are being added to reduce cargo cycling time and allow the loading and off-loading of containers from the largest of ocean-class cargo vessels. Additional deep and shallow draft access will be part of the completed port. An additional 84 acres has added to the size of a very busy west terminal. In November 2015, the Port of Gulfport was notified by the U.S. Department of Transportation Maritime Administration (MARAD) that the Port had been designated a Strategic Seaport. With this designation, America’s military will be able to utilize the Port for cargo and equipment shipments. The Navy’s newest combat ship, the USS Jackson, was commissioned at the Port of Gulfport on December 5, 2015. The ship is the first to be named after the state of Mississippi’s capital city, and the first ship to be commissioned at the Port. The port is ideally located geographically, is supported by the state, and has easy access to rail, air, and waterways. The port helps handle administrative issues and navigate regulatory requirements. The speed to permit time is fast. Jonathan Daniels, Executive Director and CEO of Mississippi State Port Authority at Gulfport explains, “The Port of Gulfport is not as large as ports in Virginia and Long Beach, but it offers the same assets, and in an uncongested manner. The future of economic development is being written by the port by supporting transportation needs for manufacturers throughout Mississippi. Pilot-to-dock time is a significant and standard measure in port efficiency. The Port of Gulfport has a Pilot-to-Dock time of 90 to 120 minutes. For comparison, ships docking in New Orleans face a pilot-to-dock time of up to 12 hours one way and require two pilots. Mississippi has a known workforce that embodies virtues of the 1950s. In Mississippi, people value family and honest work, and they take pride in their jobs and their communities. The port community offers flexibility in their longshoreman crew, who are known to work in any way to bring more business to the port and to the community. The workforce is also supported by a strong workforce development environment. State agencies and the community college system support manufacturers directly with training and education programs developed in cooperation with the manufacturing companies. The port serves as a spooling base of operations for oil and gas piping and a marine base of operations for McDermott. Utilizes the port for final outfitting of oil and gas offshore supply vessels. Final outfitting typically takes three to six months. One of the world’s largest green fruit distributors in the United States has a renewed agreement for up to twenty-three years. Chemours (formerly DuPont) has made a thirty-year commitment (up to sixty years). The company will be utilizing the port for bulk handling and dock operations. This liner container carrier transports everything from automobiles to textiles. Their operations ship from the United States to Central America and back. Says Daniels, “Look at the businesses that have located here [in Mississippi]. Toyota, Yokohama, and others. What they have found here works with their business models.